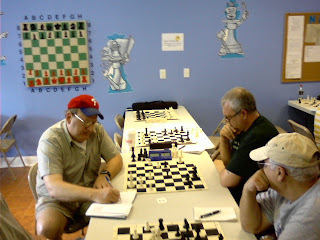 On Sunday, I played in the one-day schedule of a Swiss tournament at the Marshall Chess Club where I ended with a score of 2-1-1. The following games were my best efforts, played at the slower time control of 30/90 followed by game/60. 31.Rd5 Rg1+ 32.Ka2 Qg6 33.Rf5 Qxf6 34.Rxf6 Kg7 35.Rxf3 Re1 36.Rf4 f6 37.b4 Kg6 38.Rg4+ Kh5 39.Rg7 b5 40.Re7 f5 41.Re5 Kg4 42.Rxf5 a6 43.c3 Rxe4 44.Rf6 a5 45.bxa5 Ra4+ 46.Kb3 Rxa5 47.Kb4 Ra2 48.Rf2 Kg3 49.Rd2 Kf3 50.Kxb5 Ke3 51.Rh2, Black resigns. 32.Kf1 Qb1+ 33.Kf2 Qc2+ 34.Kf1 Qd3+ 35.Kf2 Qxe4 36.Qc8+ Kf7 37.Qxc7+ Kg6 38.Qd6+ Kh5 39.Qe7 Kh6 40.h4 Qf5+ 41.Ke3 g5 42.Qxb7 gxh4 43.gxh4 Qf4+ 44.Kd3 Qd4+ 45.Ke2 Qb2+ 46.Ke3 Qc3+ 47.Ke2 Qc2+ 48.Ke3 Qc3+ 49.Ke2, draw. Here are some pictures from yesterday's Viking Quads in Somerset. 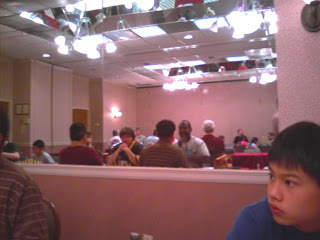 In the foreground is my first-round opponent Andrew Ng, with a mirror on the wall reflecting the other players in the tournament. These are games from quad two. 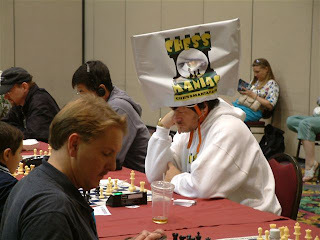 In the third quad, Michael Kagel was defeated by Kavinayan Sivakumar while Eric Liao lost to Atlantic Chess News editor Steve Ferrero. Here is action from quad four. 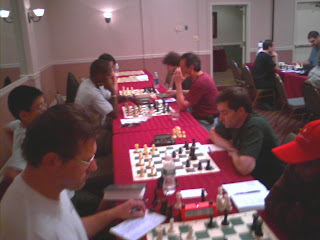 Section five was a seven-player Swiss, won by Louis Sturniolo who can be seen playing the black pieces. The top Viking quad ended in a four-way tie at Somerset today. We all had scores of 1-1-1. Here is my victory over Andrew Ng. 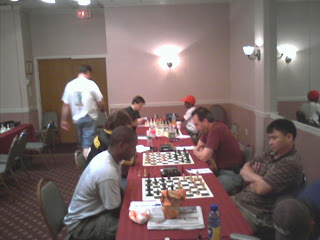 The other players in the quad were Boris Privman and Mauricio Camejo. 16.Bxf6 Bxf6 17.gxh5 a4 18.Bd5 e6 19.hxg6 exd5 20.h5 Bg5 21.f4 Bh6 22.Nxd5 f5 23.Nxf5 Bxf5 24.exf5 Rxf5 25.Qe2 Bxf4 26.Qe4, Black resigns. 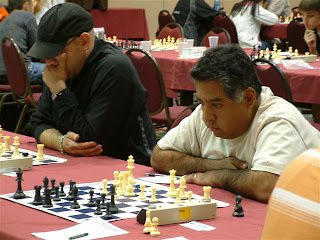 GM Mark Paragua won the New York International at the Marshall Chess Club in a blitz playoff against GM Alejandro Ramirez. 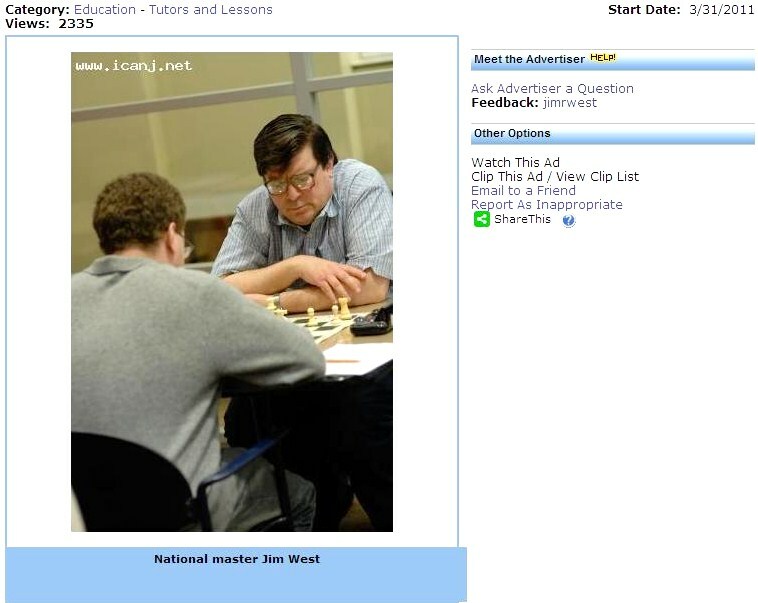 In the New York International tournament, which ended yesterday at the Marshall Chess Club, Mackenzie Molner of New Jersey achieved an international master norm by finishing with 5 points. 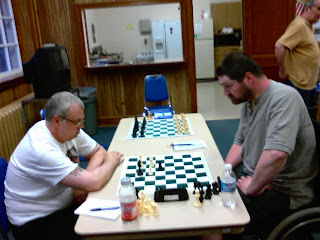 Here is Molner's victory in round seven against grandmaster Julio Becerra. As an improvement on 1.d4 Nf6 2.c4 e5 3.dxe5 Ne4 4.a3 Nc6 5.Nf3 a5 6.Qc2 d5 7.exd6 Nxd6 8.Nc3 Nxc4 9.Bg5 (Tamburro) in the Fajarowicz variation, I have looked at 8...Be6 9.b3 a4. Black gets good play for the pawn after 10.Nxa4 Bf5 11.Qd1 Nxc4 12.Qxd8+ Nxd8 13.e4 Be6 14.Bxc4 Bxc4 15.Nb6 cxb6 16.bxc4 Ra4 17.Nd2 Bc5. A likely continuation is 18.O-O O-O followed by 19...Ne6. 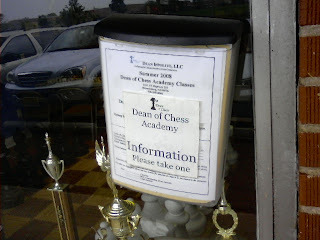 On Sunday, I took these photos at the Dean of Chess Academy in Branchburg where the Greater Somerset County Quads were held. 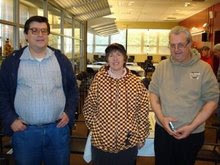 IM Dean Ippolito is participating in the New York International at the Marshall Chess Club which explains his absence from these pix. 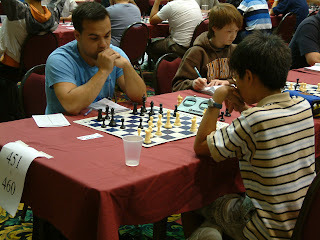 You will see tournament director Anand Mishra, as well as a game involving blogger Atomic Patzer. 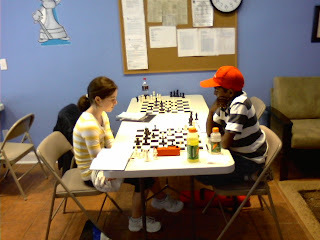 There is also a picture of two rising stars, Anna Matlin and Kavinayan Sivakumar, playing in the second round. 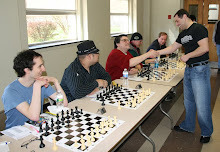 Yesterday, at the Dean of Chess Academy in Branchburg, I participated in the Greater Somerset County Quads. I won the top quad with a score of 2-0-1. Here are my games. 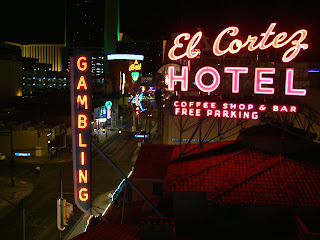 72.Kxe6 Kxg5 73.Kd5 Kf5 74.Kxc5 Ke5 75.Kb5 Kd4 76.c5 Kd3 77.Kxa4 Kc4 78.c6 Kc5 79.c7 Kd5 80.c8=Q Ke5 81.b4 Kd5 82.b5 Ke5 83.b6 Kd5 84.b7 Ke4 85.b8=Q Kd4 86.Qd6+ Ke4 87.Qce6+ Kf3 88.Qf8+ Kg3 89.Qg6+ Kh4 90.Qfh6#. 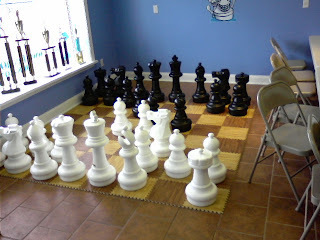 50.Ka1 Kd7 51.Ka2 Ra5 52.Kb2 Ra7 53.Rc2 Rc7 54.Rxc7+ Kxc7 55.Kc3 b5 56.Kb2 Kb6 57.Kc2 Ka5 58.Kc3 b4+, White resigns. 12.Bc3 Qe7 13.e5 Kc7 14.d4 Be6 15.Nd2 Bxc4 16.Nxc4 Qe6 17.Nd6 h5 18.Bb4 Na6 19.Ba3 Ne7 20.Ne4 Rae8 21.Bd6+ Kc8 22.Nxg5 Qf5 23.Ne4 Qg4, draw. I finished solving today's acrostic puzzle in the Sunday magazine of The New York Times. Here is the quotation, taken from Paul Hoffman's book King's Gambit. 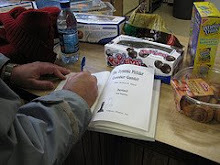 Fischer's adversaries knew that he derived unwholesome pleasure from ravishing them. When he was alone, psyching himself up for a game, people would hear him shout, "Slam! Bam! Zowie!" 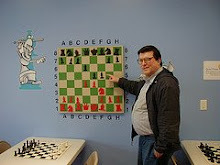 as he banged pieces down on the board. 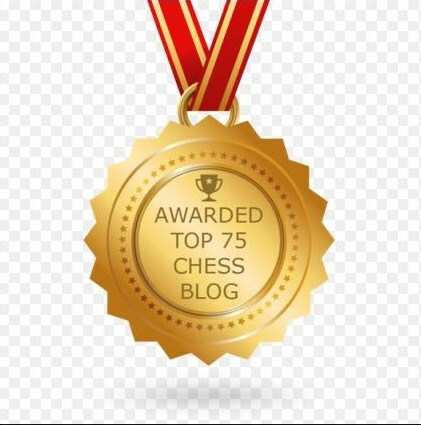 My first inkling that the puzzle had a chess theme occurred when I saw clues such as these: "Premier when Mikhail Tal was chess champ" [Khrushchev] and "One hosting the 1972 Spassky match" [Icelander]. 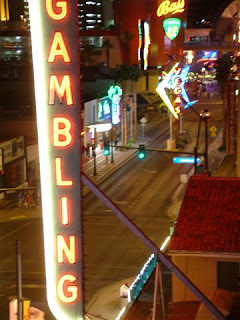 There were also clever answers like "pawnshop" and "archbishop" that played on the names of chess pieces. 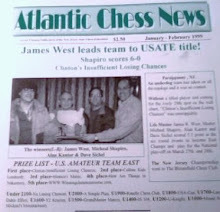 In the Under 2000 section of the National Open, Atlantic Chess News editor Steve Ferrero drew this game. White's final move 24.Bc3 is slightly inaccurate. 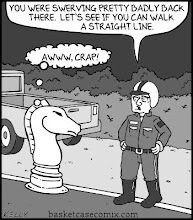 He should leave the c3 square available for his queen by 24.f4 Nh7 25.f5 Qe4 26.Qc3 Nf6 27.Rf4 Qe5 28.Qc2 Qe7 with an equal position. 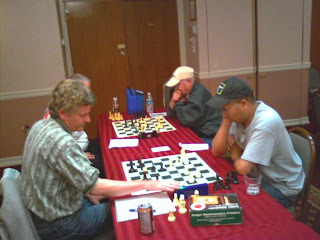 20.Bf5 Ne4 21.Bxd7 Qxd7 22.f3 Ng5 23.Qd3 Qe6 24.Bc3, draw. 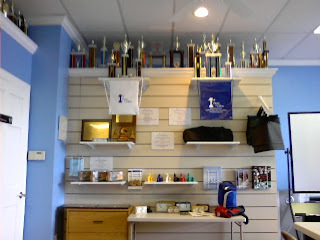 Tomorrow the New York International tournament begins at the Marshall Chess Club. 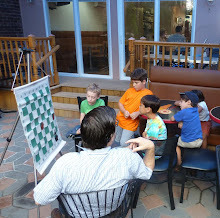 Here is an interview with GM Gata Kamsky, courtesy of the Internet Chess Club. 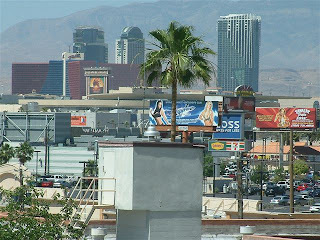 While participating in the Under 2000 section of this year's National Open, held at the Riviera Hotel in Las Vegas, Atlantic Chess News editor Steve Ferrero took these pictures. Alejandro Melchor of Barcelona has sent me the following e-mail, bringing to my attention Pete Tamburro's recommendation of 9.Bg5 in the Fajarowicz variation after 1.d4 Nf6 2.c4 e5 3.dxe5 Ne4 4.a3 Nc6 5.Nf3 a5 6.Qc2 d5 7.exd6 Nxd6 8.Nc3 Nxc4. Tamburro's move is better than Harding's 9.Qe4+. 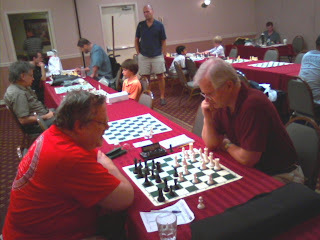 Some notes and analysis on Philidor Counter Gambit, Fajarowicz and Latvian Gambit in http://njscf.proboards2.com/index.cgi?board=amate blog of N.J. 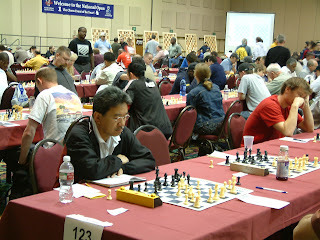 Chess Federation. Remarkable a possible refutation ( Pete Tamburro ) on Fajarowicz with your idea 3.dxe5 Ne4 4.Nf3 Nc6 5.a3 a5!? 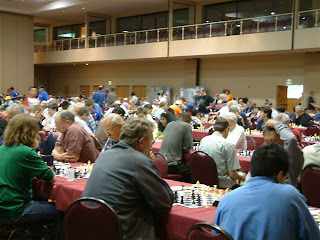 The Greater Somerset County Chess Club is proud to announce the first ever simultaneous exhibition with grandmaster Sergey Kudrin of New Jersey on Sunday, June 29, 2008. 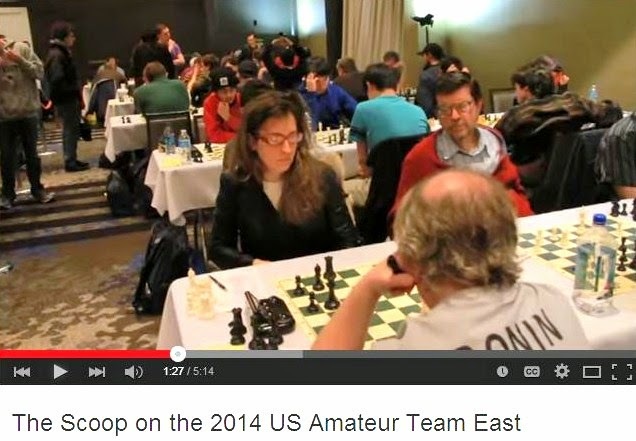 GM Kudrin recently played in this year's U.S. Championship and finished in 3rd place amid tough competition. There are 25 seats available on an advanced registration basis only. Preference will be given to scholastic players and club members, then on a first-come-first-serve basis. The entry fee for this event is $25. 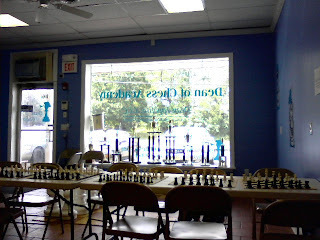 The simul will start promptly at 1:15 pm and will most likely run the duration until the club's curfew at 4:45 pm. Clocks are not necessary. 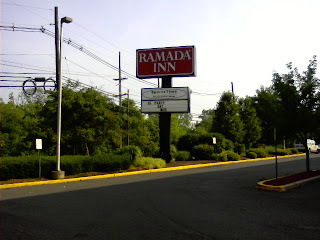 To register, please send an e-mail to AMishra63@verizon.net stating your name, age, and rating if available. 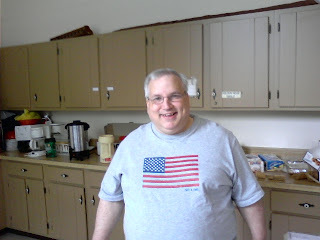 The club meets from 1 to 5 pm, unless otherwise noted, at 40 Pike Run Road, Belle Mead, NJ 08502, in the rental office building of the Pike Run Community Club House. As usual, casual play is always available to those who do not want to play in the day's structured event. Here are some pictures that I took yesterday at the Hamilton quads. 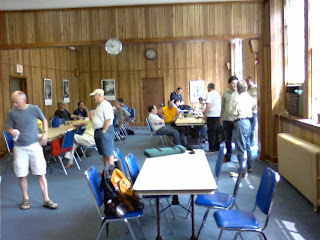 There was a good turnout, even though the quads were held a week earlier than usual. 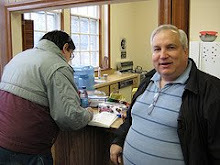 This is Sal Geraci, whose brother Ron lives on Thompson Street. 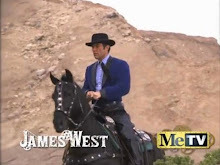 In the third round, Tom Stanics (a.k.a. 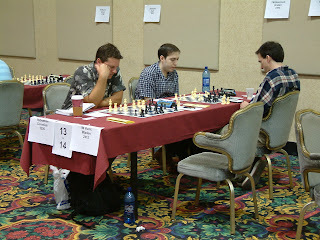 Atomic Patzer) defends his position against James Luxich. Today, at the quads in Hamilton, I played this exciting draw. 24.Nd1 Ne7 25.d5 Bxb2 26.Qxb2 Qh5 27.Kg1 g5 28.b4 gxf4 29.exf4 axb4 30.axb4 Rxa1 31.Qxa1 b5 32.Ne3 bxc4 33.Rc1 Qe8 34.Rxc4 Qb5 35.Rxc7 Qd3 36.Rxe7 Qxe3+ 37.Kh1, draw. 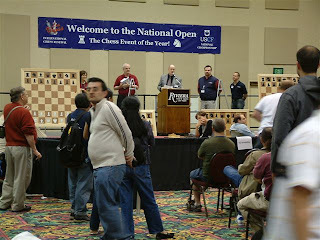 Atlantic Chess News editor Steve Ferrero has just returned from Las Vegas where he played in the Under 2000 section at the National Open. 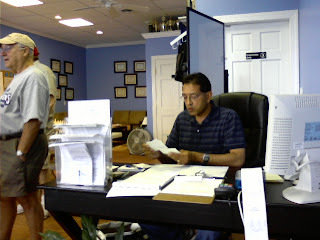 Here are some photos!